A couple of months ago, we posted about an animated A Link to the Past trailer that was created by Aeipathy Industries for a project called Zeldamotion. This project is an one that will have them converting the Legend of Zelda manga books by Akira Himekawa into a fully animated and voiced series. 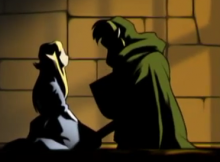 The Zelda manga that they were going to start with was A Link to the Past. To do this project though, it would require some funding in order to bring this idea to fruition, but it appears that at this time, the project will not be funded since it has only reached one-third of it’s funding requirement. With only approximately four hours left until the deadline is reached, it seems that this project will probably not be able to take root and grow. As you can see from this screenshot of this website, that as of the time of this posting of this, that the project has only reached at least a third of the funding required and there’s only four hours left until the website will no longer be accepting donations. 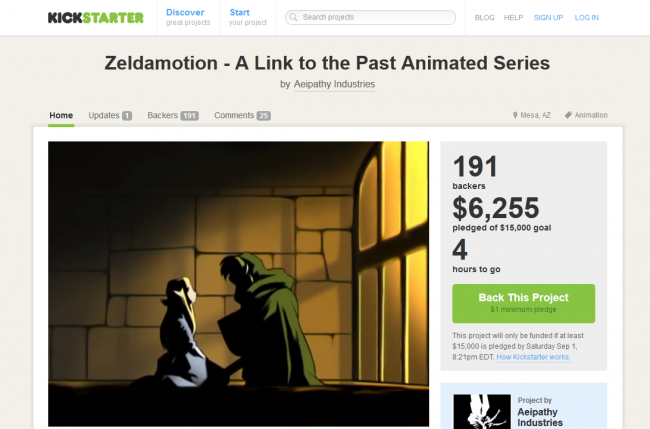 Perhaps as Zelda fans we can band together and attempt to save this project by donating and helping them reach their goal. I would hate to see this project die as it has much potential and I was really looking forward to seeing it come to life. If you wish to donate please go to this website and click on the button that says “Back This Project.” There you can choose the amount you wish to donate to help to the project get up on it’s feet. And if you cannot afford to give money, you could spread the word about this and allow it to reach people who can donate. Whatever choice you make is up to you. I’m pretty sure the people who are working on the project would appreciate any amount that you could give as well as any word that you could spread about this project.